Scrophularia parviflora Woot. & Standl. Scrophularia parviflora is an upper elevation erect herb with open panicles of small irregular flowers that are green except for the upper corolla lobe which is red. 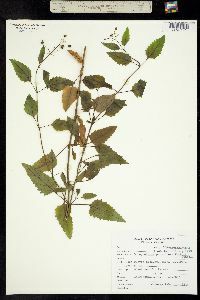 The leaves are opposite and petiolate, the petioles under a third the length of the leaf blade. The blades are lanceolate, serrate and acute. 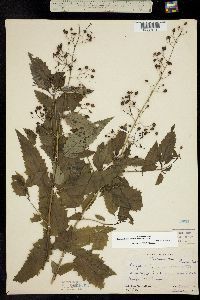 Scrophularia parviflora is found in moist canyons.